Zombie Squad • MSS Gortex Bivy review. There has been some chatter on the topic of bivy sacks and especially the MSS Gortex bivy. So during some field testing of my 72-hour BOB I decided to pack my MSS bivy and do a review for those not familiar with the MSS bivy sack. The MSS bivy is a fully taped Gortex bivy sack. The one being reviewed is unissued military surplus. Woodland camo has been replaced by the military with various digital patterns. According to my digital scale the bivy is 2lbs 2.6 oz. This is not an Ultra Light bivy. If purchased unissued it may come in original plastic wrap and have tags with NSN Numbers. Mine was made by Tennessee Apparel Corp. If you purchase one do yourself a favor and avoid the cheap imported knock-offs. Also avoid those listed as “good” issued condition. Often they are not so good. The MSS bivy has massive number 10 YKK zippers. These are easy to operate if they freeze up in winter and tend be easier to back out of a snag. 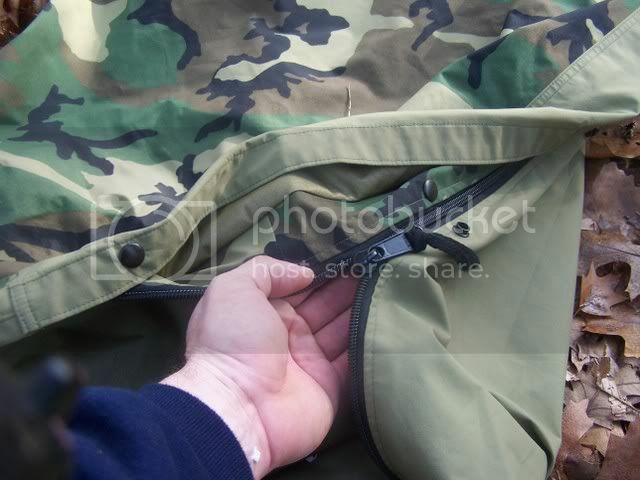 There is a flap and snaps that shields the zipper from rain. 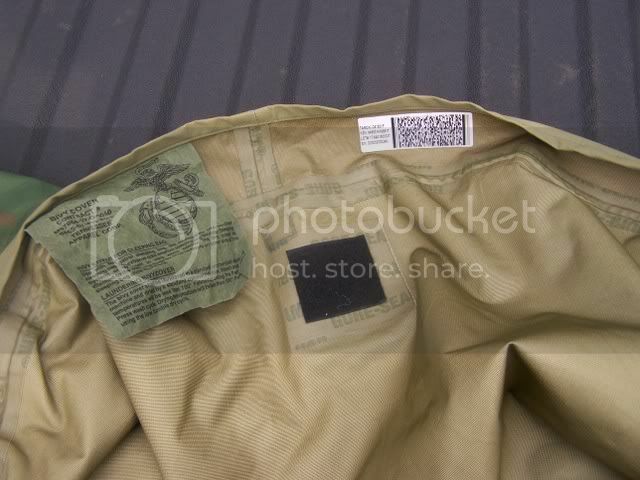 The bivy also has snaps designed for attachment to other MSS components but this is something I avoid. The head section has a draw string with Velcro to snug in place. The general shape is a bit like a cup and lip. I have crawled deep into the bivy during cold weather but frankly feel freaked out by the prospect of covering my face totally. I often sleep more on my side to avoid this. Or flip the top back some. The Bivy does provide for a stealthy camp. Very weather proof as basically the thing is already collapsed. The Gortex shell is very water resistant and wind proof. I always pack a poncho for raingear. Combining this with the bivy I get the benefits of a tarp without the extra weight and bulk. 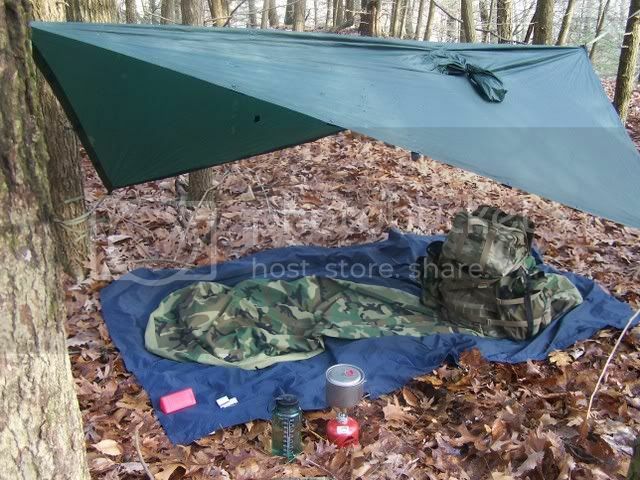 By adding a tarp or setting up the poncho as a tarp I can open up the bivy near the head section for ventilation or hang out under the tarp/poncho to change my cloths and cook. This makeshift poncho tarp setup is for moderate rain/snow and would allow someone to have a small scout fire near the shelter. If the weather turns just slide a bit back under the tarp. Avoid sparking wood like Pine as this can burn holes in the poncho/tarp or even possibly the bivy. The blue ground cloth is not necessary but adds to the comfort and protects the bivy from rocks etc. Brown would be better but this is what I had in the pack. If using a ground cloth care should be taken to ensure that the tarp overhangs the cloth. The same apples to a tent's rainfly. One of the advantages of the MSS bivy is the ability to look out in all directions. You are not closed up in a tent. Some people feel more comfortable by having four walls. I prefer to look around. This is just personal preference but could have some tactical advantages. 1. Being low to the ground and camouflaged makes for a hard to see camp. 2. Works well with the environment. Even a small 1-2 person tent needs a specific foot print. The bivy does not. 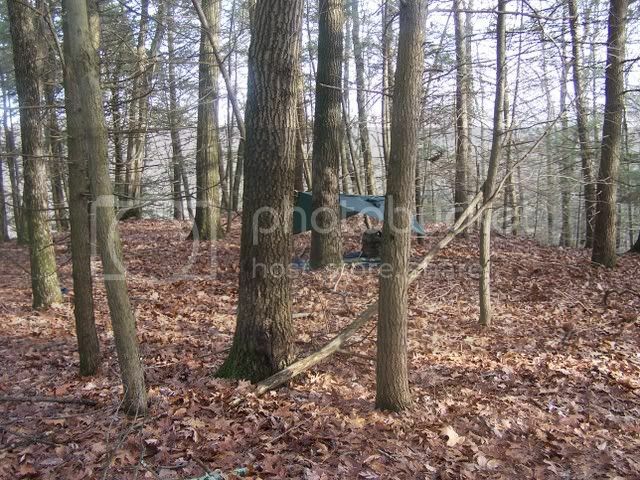 A person can even sit up against a tree inside a bivy. Also having no real fixed footprint means all one has to do to avoid an unseen rock is to roll over. A tent would have to be moved. 3. Packs down smaller than most ultra light tents. 4. Offers an extra layer to any sleeping bag. 5. Instant setup and take down. Even when using a poncho/tarp it often takes me minutes. 6. Less prone to weather related structural failures as there is no support systems like poles to bend or walls to catch wind. 7. Tactical coolness factor. I can’t put my finger on this but sure seems cool to me. 8. You can sleep near a fire for warmth. Hard to do in a tent. 1. Your body is protected from bugs and critters but the head is not. I have spent a few nights crawling deep into the MSS bivy in the hopes that the mosquitoes buzzing around my head would not bite. A Mantas bug net or similar system adds 4oz and should be purchased. 2. Not an Ultra light bivy. Once you add in the bivy and other accessories you are very near the weight of some ultra light 1-2 man tents. 3. Some people feel more comfortable in a tent. I do not but the physiological factor of having 4 walls is an issue with some. This is not the berate people who do. Anyone that claims to fear nothing is either a lair or stupid. Possibly a combination of both. 5. Offers less protection from weather than a quality tent. 6. Not dirt cheap. 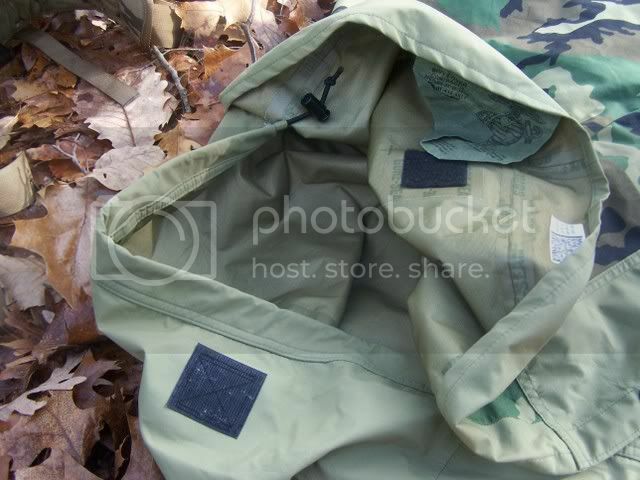 I got my bivys unissued for around $85.00 from EBay a few years ago. I don’t know what they are going for today but you must shop around. 7. Condensation can occur in both tents and bivys but if the shell gets covered in ice the Gortex will not breath. Have gotten damp a few times like this. A tarp or poncho helps. 8. Like most Gortex products I am thinking there is a DWR coating. This is why the water runs off the shell. After extended use this must be re charged. Not expensive or complicated. Nikwax works. The MSS bivy works well for me. Like everything else it has pros and cons. That was a great write up Woods Walker..... I have been planning on picking up a complete MSS for my BOB. A good sleeping bag is pretty much one of the last things I need. 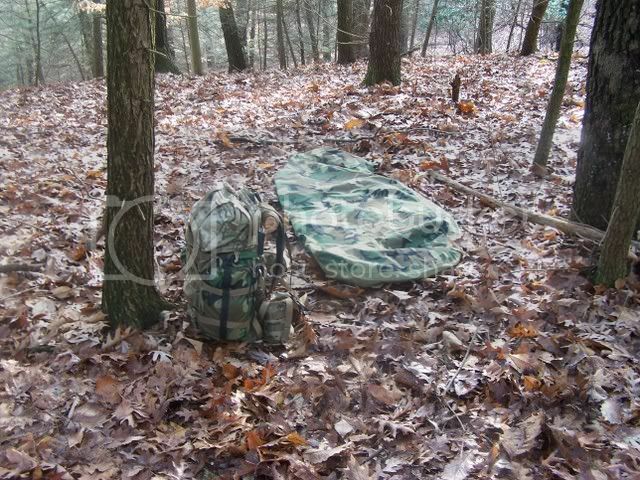 Woods how many degrees would a bivy cover like yours add to a bag? I have had a military mummy style bag for years. I think the bivy will be a nice addition. I have to admit I feel a little cramped in the bag, but if I take the bag I feel comfortable in I won't be taking anything else. So I am willing to compromise. I have a complete MSS and have found it to be a good bag. In very cold weather icing can be a problem and was for me recently. I slept one night with the bivy hood over my head/face and woke with the inside of the bivy coated in powdery ice. Luckily the next day was sunny so I opened up the bag a put it in the sun to dry (which it did). I have slept out in the open with the MSS and a thermarest in teen/twenty weather and was quite comfortable. Great piece of kit for sure. Tip-Toss your thermarest and foam in the bivy with you and you won't slip off of it in the night. I am thinking maybe 10-15 degrees as the bivy is one of the warmest I have used. But this is totally subjective. Great tip on putting the pad inside the bivy. I have done this and it works great. Great write up! 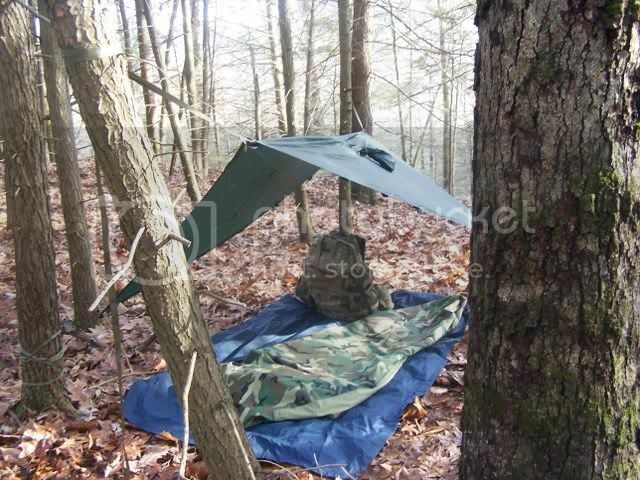 I will do one of my own if I get my MSS bivy soon. I would like to take mine up to the snow and see how that works out. If I can work up the cojones and find the time I will be posting a review of that trip soon. I cant say enough about these things. Buy one instead of a bag with gortex integrated into it, or simular multi layer mumbo jumbo. You can use all the money you saved to buy more beans and bullets. I paid less than $35 shipped. This seller is great I got it within 4 days. They have over 17000 positive feedback at 100%. I can't wait to try it out. Just thought I would pass it along. Thats a smoking deal. I just got mine today as well from another seller. It is the real deal. I am very pleased. Great news guys. Keep us updated how the bivy works out. Woods, have you ever made a crappy thread? Stop making the rest of us mooks look bad. $35 shipped? Even I can do that! I put my air mattress between the cover and bag. It made things a little more cramped but not to bad. I have one of those head nets and have used it. Funkey but worked. You just have to make sure that it is not touching your face. That remindes to put it in the stuff sack. Here's a few shots of my MSS set up. Contents: MSS bags/cover, USGI ponch, ground cloth, airmattress, 50 chord, adding water shoes, benie, hed net. Here it is all rolled up. Weighs 14lbs on the bathroom scale. A bit much for some I'm sure but I do most of my camping above 6500ft. I don't have to carry it so I'm happy with it. I'm WW on not liking tents. This works well for me but I will say the wind out here at altitude is brutal and staying out of the wind is still important under those conditions. WW nice review. I was interested in you impressions. Thanks. If anyone is interested I have a compression bag from MSS. It is identical to the one pictured above. I have it listed in the trading post. I will load it up with a bag today and snap a few pics and update the post. Great thread! Very helpful and informative. I was a little leery of using the Bivy sack from my MSS (which I also got off Ebay..but for $100 with shipping), but I guess it should work out well if I get a good mosquito net. Thankfully, I won't need the Intermediate Bag here in Central Florida unless something really unforseen happens (and I intend on getting a high quality poncho liner for a backup for my BOB). Deleting that, I assume it will reduce the weight of the system when I put it back into the compression sack. Hmm...need to get a tarp, second poncho and mosquito net now. I plan on using my surplus GI sleeping mat so my back doesn't get hosed up 9 ways to Sunday. I'll have to see about testing out the system sometime in the next few months (will have to camp out for a day or two during the week since I work weekends). 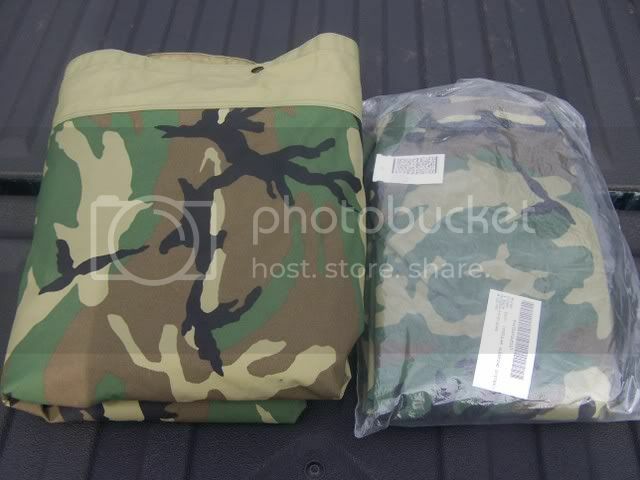 This week I ordered a MSS bivy sack from the same eBay vendor mentioned above, gruntgear. It was $50 shipped and arrived two days after the auction ended. Mine was described as "used but in great condition." I can't find a thing wrong with it, so I would describe it as used but in excellent condition. I highly recommend ya'll get one from this eBay vendor. I have never slept in a bivy or under a tarp for shelter. 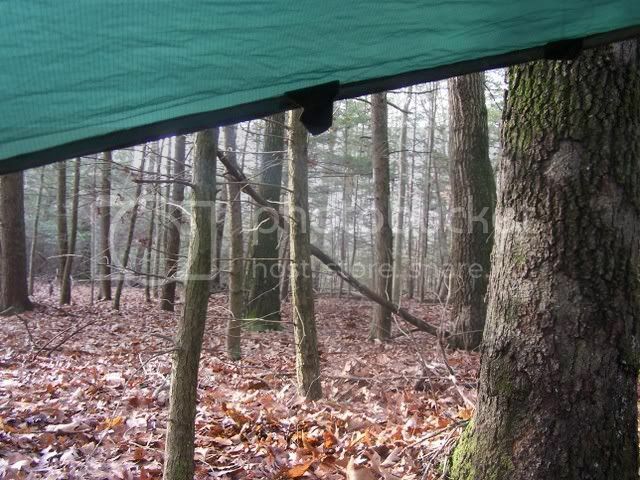 I've always used either a Kelty Vortex 2 tent or Hennessy Hammock Expedition model when camping or backpacking. My Hennessy Hammock weighs 2 pounds and change with the tarp and my tent weighs 6 pounds and change. But anything under about 60 degrees and my Hennessy hammock is too cold for me to use. My plan is for my bivy to replace my tent in my BOB. I'll save about 3 pounds in my pack when I add a silnylon tarp to the system, plus I believe the bivy will add some warmth to my 30 degree sleeping bag. In addition, if I add a bivy to my pack and my wife's, plus a tarp, this system will be much more low-profile than my tent with its light grey rain fly. I appreciated Woods Walker's review of the bivy, as it helped me decide to get one for myself. I just ordered a second bivy from Gruntgear. This time for $35 shipped! A great deal for a quality product. That's it. I'm getting a bivy for my old ECW mountain bag. Glad you guys made out. They were selling a new bivy in Reno today at the gunshow for $70. Does anyone have experience with using the whole MSS? What are your opinions on the bags? Hoshun wrote: Does anyone have experience with using the whole MSS? What are your opinions on the bags? I already have a sleeping bag and a bivy, but my bag is only rated 0. Also I like having redundant gear, and I was thinking of looking around for a complete MSS. When I'm not poor anymore, that is. I can afford to buy what ever I want but I use the MSS. It does for me exactly what I want. Warmth, wind protection (to a degree), rain protection (to a degree), it's a rugged system. 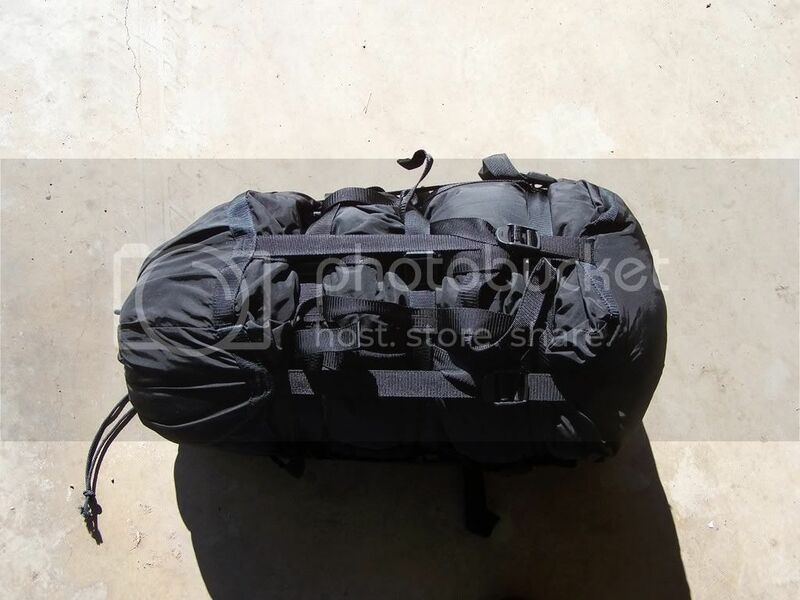 However, it is heavy and I would not use it for backpacking. I would buy a super high speed -20 bag and just use the bivy if I were backpacking. I don't (can't) backpack and everywhere I go is with my truck. Weight is not an issue. Still it is light enough that I could schlep it along for a ways if needed. I don't need another bag but if a full MSS comes by my door that's new and the price is right I'll buy it. Another good car camping option is the EWC army mummy bag with a MSS bivy.